Book News: Ex-Supreme Court Justice Wants 6 Changes To Constitution : The Two-Way Also: The battle over the word "literally," Claudia Rankine won the $50,000 Jackson Poetry Prize. 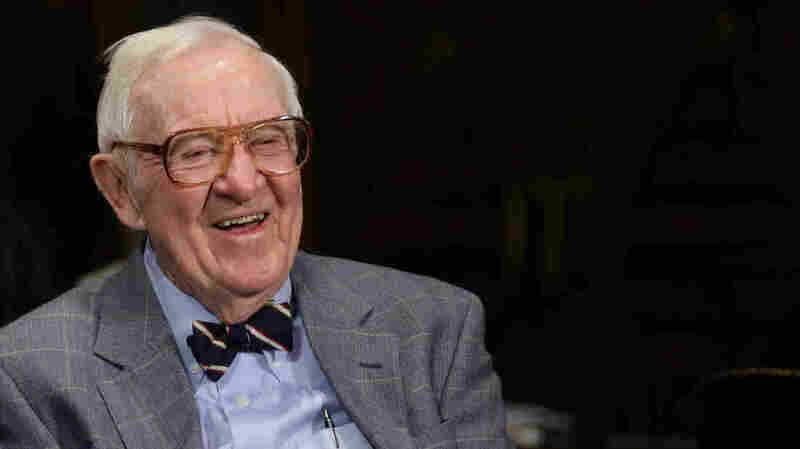 Former Supreme Court Associate Justice John Paul Stevens, pictured in 2013, has a laundry list of legal changes he'd like to see and thinks "ultimately each will be adopted." In a book out Tuesday, retired Supreme Court Justice John Paul Stevens proposes six amendments to the U.S. Constitution, including measures aimed at preventing gerrymandering (that is, redrawing district lines for political advantage), abolishing the death penalty and allowing limits on the amount of money that political candidates and their supporters can spend on campaigns. Other amendments would promote stricter gun control and abolish states' sovereign immunity. The 94-year-old Stevens writes in the preface to his book, Six Amendments: How and Why We Should Change the Constitution, that of his proposals, "the first four would nullify judge-made rules, the fifth would expedite the demise of the death penalty, and the sixth would confine the coverage of the Second Amendment to the area intended by its authors." He added that he is confident "ultimately each will be adopted." On Monday evening, state Rep. Thomas Carmody shelved a bill to make the Holy Bible the state book of Louisiana, saying the issue had become a distraction. Carmody initially tried to designate a particular copy of the Bible from the Louisiana State Museum as the state book, but the bill's language was eventually changed to refer to the King James Bible, and then just to "the Holy Bible." Critics, including the Louisiana ACLU, called the bill discriminatory and complained that it blurred the line between church and state. The novelist Salman Rushdie remembers Gabriel García Márquez, who died last week at age 87: "The trouble with the term 'magic realism,' el realismo mágico, is that when people say or hear it they are really hearing or saying only half of it, 'magic,' without paying attention to the other half, 'realism.' But if magic realism were just magic, it wouldn't matter. It would be mere whimsy — writing in which, because anything can happen, nothing has effect. It's because the magic in magic realism has deep roots in the real, because it grows out of the real and illuminates it in beautiful and unexpected ways, that it works." Claudia Rankine has won the $50,000 Jackson Poetry Prize, an annual award given "to an American poet of exceptional talent who deserves wider recognition." Rankine's poems are an interesting melding of essay and poetry — one of her prose-poems, "Don't Let Me Be Lonely [There was a time]," begins: "There was a time I could say no one I knew well had died. This is not to suggest no one died. When I was eight my mother became pregnant. She went to the hospital to give birth and returned without the baby. Where's the baby? we asked. Did she shrug? She was the kind of woman who liked to shrug; deep within her was an everlasting shrug. That didn't seem like a death. The years went by and people only died on television—if they weren't Black, they were wearing black or were terminally ill. Then I returned home from school one day and saw my father sitting on the steps of our home. He had a look that was unfamiliar; it was flooded, so leaking."